The China Motor Vehicle Documentation Centre (the centre behind www.chinesecars.net) was established in the Netherlands in 1973 by Erik van Ingen Schenau. We supply data concerning the Chinese car industry and are well known for our accuracy and high level of services. 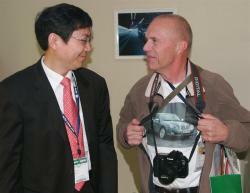 Do not hesitate to contact us when you need specific information on the auto industry in China.